Michele Ferrero (1925 – 2015) was one of the most important Italian businessmen, owner of the eponymous Ferrero Group. Son of peasants, after the second big war, together his wife he opened a pastry shop in Alba (Cuneo). In 1946 Michele was the man behind the company’s development, creating many new products purchased today by millions of consumers around the world, opening factories and representation in Germany and France, and then exporting his articles overseas, from Australia to Ecuador. Michele is the inventor of the most famous Ferrero products: Nutella (1964), Mon Cheri (1956), Tic Tac (1969), Ferrero Rocher (1982), up to the Kinder line that now represents about 50% of the Ferrero turnover. Thanks to the continuous territorial expansion, and production lines, today Ferrero is one of the leading confectionery worldwide, with over 34,000 employees in 53 countries, 20 production facilities, 3 of which are operating in the field of social enterprises in Africa, and Asia and 9 farms. By Michele Ferrero’s will, in 1983 was born the Ferrero Foundation, based in Alba, which has the dual objective of taking care of ex-employees Ferrero and to promote cultural and artistic initiatives. Indeed, in its logo appear the three verbs that characterize his phylosophy : “Work, Create, Donate”. In 2005 he created the Social Enterprises, already active in India, South Africa and Cameroon, not only based on a purely Conception entrepreneurial, but acting with a “social” spirit, as they are aimed on the one hand to create jobs in disadvantaged areas emerging countries, and to also carry out projects and initiatives to promote children’s education and health in the areas where the establishments are located. Perhaps the best-known product in most of the world is “Nutella”, trade name of an Italian hazelnut cream made from sugar and vegetable oils to flavor cocoa and hazelnuts. It was created in 1964 by the confectionery Ferrero in Alba, from a previous cream called Giandujot and then Supercrema. The name comes from the noun “nut,” and the Italian suffix “ella” to get a catchy name. Today Nutella is probably the most widespread “chocolate spread” in the world, whose main ingredient is the hazelnut, once taken from the local hazelnut plantation where he was born. Mr. Michele, as his collaborators always called him, had the idea of planting trees hazelnuts in the South, so that he could have at disposal fresh hazelnuts at any season. From that visionary project was born 8,000 hectares of crops in Chile, Argentina, South Africa, and Australia, where have been planted 6.6 million of trees. The latest reports claim that sales have been of 350 thousand tons produced each year. Since the beginning Ferrero adopted reusable glass containers as a form of incentive to buy the product. Once emptied of its contents, the container can be used as a container. The glass jars were soon embellished with multi-color images and a characteristic shape. During the feast of St. Peter and Paul, Michele had a habit of visiting his Ferrero Foundation in Alba. Here he greeted older workers and talked with other workers, and maybe tasted his products too, keeping the air conditioners to the maximum so that the chocolate did not “suffer” the heat “. Frequently he went to various supermarket to buy its products and those of other brands to verify freshness and differences. In each factory Michele asked to put a statue of the Lady of Lourdes, but not to offend Muslims, the designers did not put it in the factory in Manisa, Turkey. Michele Ferrero did not like to waste money, except for his favorite cake that he commissioned for some event to a trusted confectioner, and then carried by a helicopter to Alba. Dwelling in Monaco where he lived in recent years, next to the villas of his son John and Louise, and the widow of his son Peter (who died in 2011), his last joy was being with his five grandchildren ((Michele, Bernardo, Michael, Marie Elder e John). He wrote for them a affectionate letter, during the celebrations for the 50th anniversary of Nutella, celebrated in May 2014. He ideally passed the baton to the fourth Ferrero family’s generation. Our nation still is the emblem_ of closed-mindedness. This time is the Barilla’s brand_ to impress_ the audience_ worldwide. While companies, such as Ikea, launch spot that continually refers to the “_new-families_” and “extended_families”, which are no longer simply made by dad, mum and son, some brands just draw back and still aim on the “traditional”. With these sentences, the firm made Italia and abroad indignant. _Napolitans_ also has remained agape, and the known Neapolitan group of independent_videomaking called “the Jackal” for only answer created a _clip_ dedicated to Barilla ads, but with a gay couple. I’ve talked about Neapolitan Christmas’ desserts in the post “Neapolitan Sweets”, but I now want to say more about Roccoco, the most famous and typical sweet for us. This sort of biscuit can’t lack in each Neapolitan home because is synonymous with Christmas, and marks the end of lunch during Christmas period. 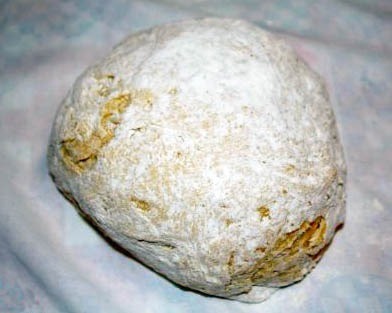 A sweet that comes from patience and dedication of the Real convent of the Magdalene‘s sisters, which perhaps is due the first preparation of the Roccocò, whose oldest recipe seems to date back to 1320. Their name probably is derived from the French word “rocaille“, due to their hardness and baroque round shape, like a rounded shell. Their shape, color and flavor talk us of the past, because Roccocò are impenetrable sweets, hard, dry, prosperous and humble at the same time, but yet affectionate and flavorful in their donut shape. A tradition by now! These biscuits are more suitable for those who have solid teeth… unless you eat them some days later the preparation, or add some yeast and cook them for less time. Some prefer to soak them in wine or liquor. Preparation that is pretty easy but needs some ingredients that might be difficult to find in your countries. Two of them are called “PISTO” and “VANILLINA”, products already prepared powder and sold in small sachets. The benefit to using a powdered product is that when you mix it directly into a batter or a cookie dough you get the straight flavor and, like vanilla extract, without it being diluted in the alcohol. “PISTO” is an important ingredient that gives Roccocò their typical flavor. It is formed from a mixture of various spices: cinnamon, nutmeg, cloves, coriander (cilantro) and dill. If you can not find the Neapolitan “Pisto”, you can prepare something similar by whisking together 10 cloves, a nutmeg half chopped, and half a stick of cinnamon; or mixing 2 grams nutmeg, 3 grams of cinnamon and 2 grams of cloves. I’d also add a teaspoon of anise liqueur, if you have it available. 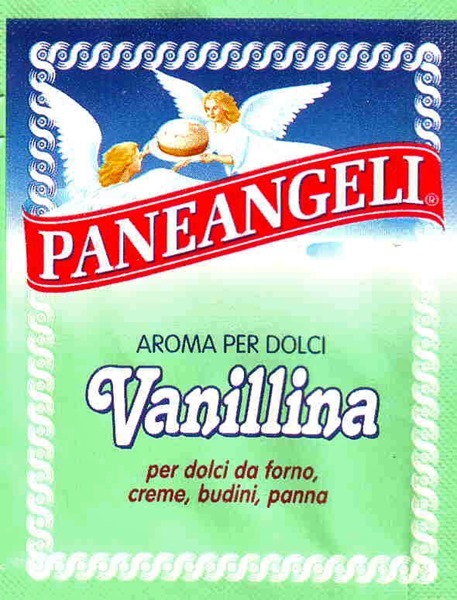 “VANILLINA” is vanillin or vanilla extract. It is a mixture of several hundred different compounds in addition to vanillin. Artificial vanilla flavoring is a solution of pure vanillin, usually of synthetic origin. Today, artificial vanillin is made either from guaiacol or from lignin, a constituent of wood, which is a byproduct of the pulp industry. 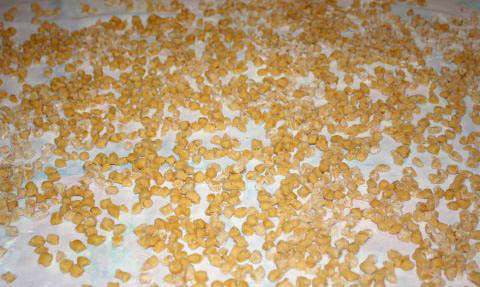 It’s used in very small quantity, like 1 gram (0,3 ounces) for a 500-600 grams cake (16-18 ounces). Failing that, you could use the vials with essence of rum, lemon, vanilla, bitter almond, butter-vanilla. Essences that you can find in some supermarket or drugstore. 1 whole egg beaten, for brushing over the surface of the Roccocò. On a work surface pour the flour, sugar, pisto and salt. Add the fruits’ peels chopped in very small pieces, the grated lemon’s peel (you could replace them with small pieces of candied fruit), the vanilla, cinnamon, cocoa, ammonia and salt. Add at little a time the lukewarm water mixing with your hands the compound. Amalgamate everything well until you get a homogeneous and rather compact mixture. Knead until the dough comes off from surface and hands, becoming dry and consistent: I recommend you do not add more water than necessary. You should get a homogeneous and rather compact mixture. Finally insert the almonds, distributing them evenly throughout the mixture, amalgamating it again if the case. Meanwhile, roll up different parts of the compound to form long strips like snakes. Cut each strip into several pieces about 15 cm long, and roll each to form a ring, no larger than 5-7 cm. Flatten lightly them, to get small-sized donuts, and arrange them -spaced apart – on a baking sheet covered with parchment paper. Brush their surface with the beaten egg and bake at 180° C. for NO MORE than 18-20 minutes. The right time they become “dark gold”. Extract them from the oven after that time! (These cookies become harder as the cooking time increases!) Note that they appear soft when warm, but begin to harden (how they gotta be) as they cool. 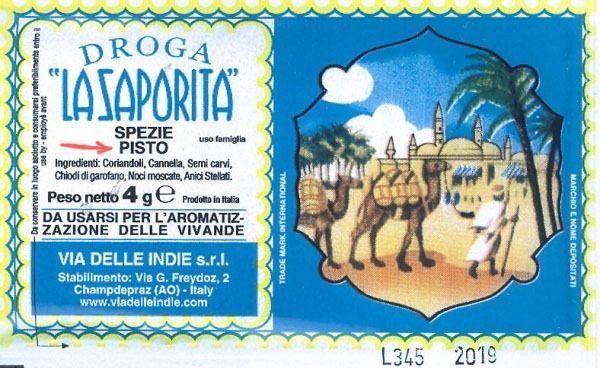 (*) – We usually use the Alberti “Strega”liqueur. 1 – Put the flour and sugar to form a sort of volcano with a hole, in which you will beat a little bit the eggs. Add the oil, salt, sugar and all the spices/seasonings. With a spoon begin to mix the flour, then knead with your hands. The dough must be quite soft, but not too stretchy! (if it is too soft, you can add other flour, or a bit of water if it is too hard). Sprinkle the dough – shaped like a ball – with a little flour and leave it to rest, covered with a towel, for an hour. 2 – Knead again the dough and cut it to obtain various narrow and long sausages not thicker of your little finger. Cut each piece into many sections no longer than 1.5 cm, thereby resulting in a large number of small cubes. 3 – For frying use a large pan large and put enough oil for frying. Bring the oil to a temperature above 150° C and add the cubes of dough, as many as the pan allows. 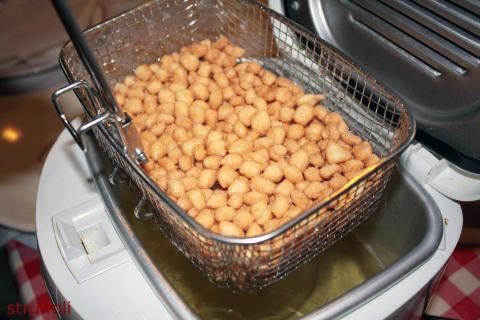 Fry until they become “golden” colored, and go forward until you have fried all the cubes, which you should put in a container to dry with paper towels. If you have a deep-fat fryer, even better. 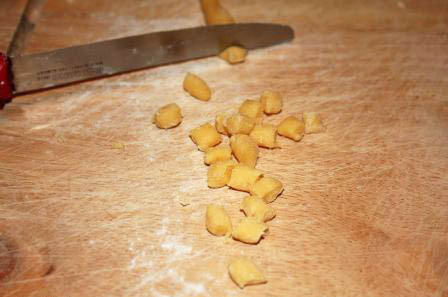 4 – Meanwhile, prepare the garnish. Cut into small pieces the pieces of candied fruit, and if you want you can stay a few whole pieces for garnish at the end, as you also can add small colored sugared almonds or chocolate shavings. Put the “struffoli ” in the tray that will be used for the course. 5 – Now you have to be very fast to prevent the honey will become solidified! 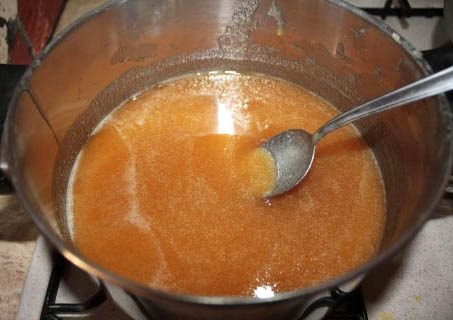 Put in a pot the honey, sugar and anise and sew over low heat until it becomes dark golden colored. 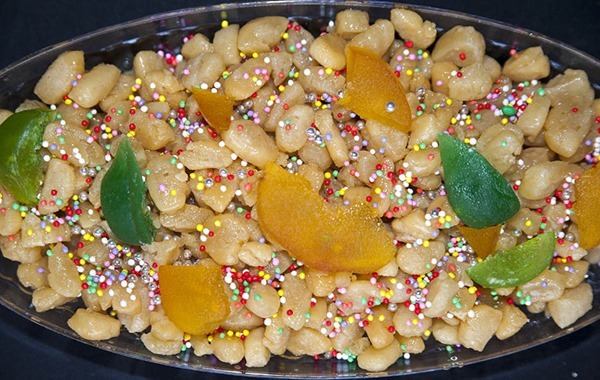 Pour quickly it on the “struffoli ” while still warm, and mix to ensure that each piece is coated with honey. Quickly add the candied fruit and garnish, giving to the whole the shape of the tray or the one you want. Allow to cool. I have already mentioned something about this in the past, but considering that during Christmas, dried fruit becomes a common food that is often found on Neapolitans’ tables, it is worth saying something more. Preparation and use of dried fruit dates back to ancient times, when fruits and seeds available during the fall, such as walnuts, chestnuts, hazelnuts, were dried or cooked to preserve and eat them during the long and poor winter months, when most fruits and vegetables were lacking. Although nowadays the dried fruits are available throughout the year, thanks to the food industries that sell them packaged, in Naples, during the Christmas period, all grocery stores and supermarkets sell different dried fruits because Neapolitans, from time immemorial, are accustomed to eat them after lunch, during these holidays. Munching walnuts or cracking some hazelnuts’ shells is considered almost as a pastime for Neapolitan’s families, so that they all together stay a little longer at the table during lunch or dinner. roasted with their shells that costs 2-4 euro per kilo. called “Priest’s chestnuts” (probably because in the past they were the monks who prepared and preserved them for the winter). I do not know exactly what is their method of preparation, but despite dry, these chestnuts are very tasty, fragrant and soft Probably they are steamed, a way to enhance taste and smell. They cost 14-16 euro per kilo. dried seeds, with or without salt. Nearly 10 euro per kilo. dried figs, often sprinkled with honey and stuffed with walnuts or almonds. dried dates, natural or sprinkled with honey. Then, walnuts, peanuts, salted pistachios, chickpeas, etc.. etc..
A few months ago the Italian Rana family opened a pasta-restaurant in Manhattan by the name of “LA MIA CASA” (my home). 140 wooden tables, marble shelves, a spectacular ceiling made ​​by hundreds of pots, graters, sieves and ladles of copper. This eatery opened in Chelsea Market is a mixture of vintage Italian architecture and industrial-urban. From long the group Rana is a well known brand in Italy for the production of fresh pasta. Here, there is not a supermarket that does not have packs of “tortellini” marked “Rana” in its counter-fridge. Over the years the products produced by the Rana family have diversified, and today we can find different types of “fresh pasta filled”, with mushrooms, spinach, ricotta cheese, artichokes. In just four years the Italian company has opened 28 restaurants in Italy, 5 in Switzerland, one in Madrid, London and Luxemburg, through a franchising program. 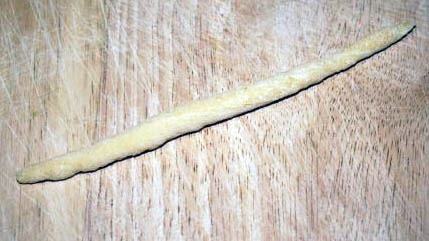 The decision to open a restaurant in the heart of New York has the aim of promoting the fresh pasta to the Americans. And after investing € 2 million and having trained 100 employees, with the raw materials imported directly from Italy, in Manhattan the fresh pasta will be produced on-site, about 250 kilograms per day, to the delight of the Americans. The World’s 50 Best Restaurant has been prepared based on the votes of the Diners Club World’s 50 Best Restaurants Academy, a group of food critics, chefs, restaurateurs and gourmets long course. The Academy is made up of representatives of 26 macro regions of the world, each of which is composed by a jury of 36 members. The brothers Joan, Joseph and Jordi Roca, who run El Celler de Can Roca (Girona in Spain), have stood on the top step of the podium in the ranking The World’s 50 Best Restaurants. In the hit are 29 European restaurants, including five Spaniards and six positions occupied by the French, even though most of them lose altitude. Italians retain a strong presence with four restaurants in the standings, in particular up to third place the chef Massimo Bottura with its Franciscan Osteria di Modena, picked up as the best. Its cuisine embraces centuries of Italian tradition in a modern way, and on the podium gaining two positions compared to 2012. The other Italian restaurants, reported in the rankings, The calenders are brothers Alajmo, in twenty-seventh position, and Combal.Zero of David Scabin to 40th place. He made his debut among the top 50 restaurants in Piazza Duomo in Alba with chef Enrico Crippa, 41st. Nadia Santini of Dal Pescatore restaurant of Canneto, won the award for Veuve Clicquot World’s Best Female Chef.